Gingivitis is a condition caused when bacteria surrounds the teeth and enters the gums. The gums can become irritated, inflamed and often bleed. In order to prevent the condition from worsening, regular hygiene visits are highly recommended. During your visit, our Hygiene team will teach you the proper flossing techniques and oral hygiene protocol for home care will prevent Periodontal Disease. Periodontal Disease is a quiet disease that begins with little or no symptoms. It is caused by bacteria that surrounds the teeth and enters the gums. The immediate condition is known as ‘gingivitis’. The gums become irritated, inflamed and often bleed. If not properly treated, the condition worsens. Noticeable symptoms start to appear. Silver fillings known as amalgam have been around for decades. Made from a metal alloy, it was the best restoration for fillings. The metal expands and contracts with the heat and cold placed in the mouth. This allowed for little bacteria to enter a tooth once filled, keeping the tooth healthy and strong. White fillings, also known as composites are often made of plastic or glass polymers. These cosmetic fillings allow us to fill a cavity with a substance that will look and feel just like your existing tooth structure. This restoration is created with a resin material and fits tightly into the tooth to prevent decay. Rather than a gray or silver material in your mouth, the composite color will match your tooth color. There are several ways to enhance your smile. Tooth Whitening must be monitored by Dr. Say and only done after a comprehensive exam and hygiene cleaning. Bonding is a cost effective procedure used to fill gaps in front teeth and change a tooth’s color. The immediate results are amazing. Within a few hours, you will have a great smile! Bonding like Tooth Whitening may change color over time due to coffee, tea, pop and wine. A crown is a permanent cosmetic procedure that covers the entire tooth. It will change the size, shape and color of the tooth in as few as 2 visits. A Dental Implant is a “man-made” replacement for a missing tooth or tooth root. Made from titanium, this screw-like object is inserted under the gum and directly into the upper or lower jaw bone. There is usually minimal discomfort involved with this procedure. After a period of a few months, the dental implant and bone fuse together. This creates an anchor for the new tooth to be placed onto the dental implant. look and function like your natural teeth. are a permanent solution for missing teeth. 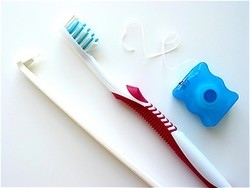 are maintained by routine hygiene visits to Brock Dental. decrease the possibility of bone loss, periodontal disease, tooth movement, and further tooth loss. replace the need for a removable full or partial denture. focus only on the tooth or teeth that are missing. A traditional bridge would involve the two or more adjacent teeth being compromised to create a false tooth in between. The next visit is to place the implant. A local anesthesia is applied to the area. (Any additional sedation is no longer necessary unless deemed by the Prostedontist). He will then make a minor incision to place the implant. The implant is placed into the jaw bone. The area will then be covered with sutures. The procedure is usually completed with minor pain. You will next come to Brock Dental in approximately 3 months to begin creating the porcelain crown to place over the implant. Fees for dental implants vary. Always schedule an implant consultation to discuss the procedure and all fees involved. With routine dental hygiene scheduled and proper home care, a dental implant can last for many years. Please contact us to discuss the options we have available to make your perfect smile today.